2draw.net - boards - Intermediate - Random-ness. Ah, a werewolf lady. 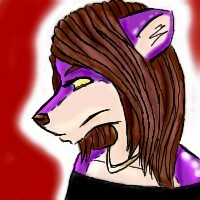 8) I like the purple, but the shinies make her look her fur's made of rubber. Her fur is rubber. D'oh. : I dunno Cello. Would you prefer it to be a guy? what makes it a she? *raises hand* Oh, but there's nothing stopping a guy from wearing a necklace or having long hair. The hair which I lurbes. ...and so I mutilate the English language even furthur. hehe. She's very cute. =3 It looks so fine and smooth...Excellent!! wat wos thhaattt dagon grill? nice detail on the hair.